THERE WERE TWO PURCELL FAMILIES, THAT OF SAM PURCELL AND THAT OF JAMES PURCELL. NO TIE HAS BEEN FOUND. SAM PURCELL'S FAMILY LEFT TABLE ROCK, LEAVING ONLY THE GRAVES OF HIS WIFE'S PARENTS, ASAPH & HANNAH FAIRBANKS, AND LITTLE IS KNOWN OF THEM. ​THE PAGE BELOW IS FOR THE JAMES PURCELL FAMILY. The arrival of James Purcell is noted in this 1882 compendium. After identifying settlers who arrived by 1858, it observes: "A little later came C. H. Lane, James Purcell, Richard Linn, John Linn, S. T. Linn, J. L. Linn, W. S. Linn, T. A. Linn, William Linn, E. A. Hanson, John Taylor, M. H. Marble, J. Allison, G. W. J. Dare, John Blacklaw and Israel Cummings; and still later, a host of others, too numerous to mention. " 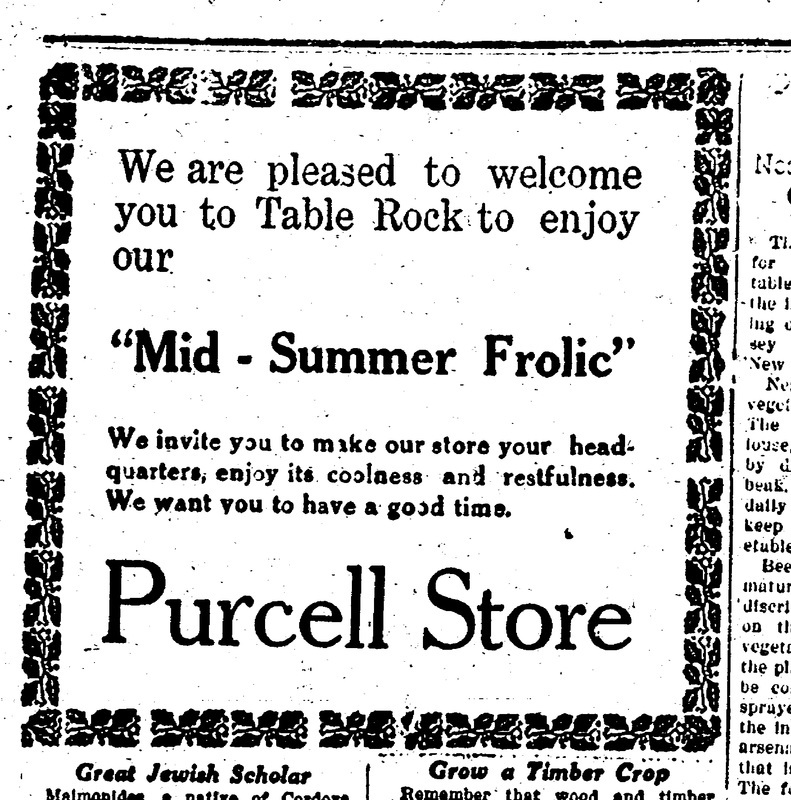 Below are photographs, newspaper articles, and commentary about the Purcell family. They are not in chronological order as the dates are not known for some of them. 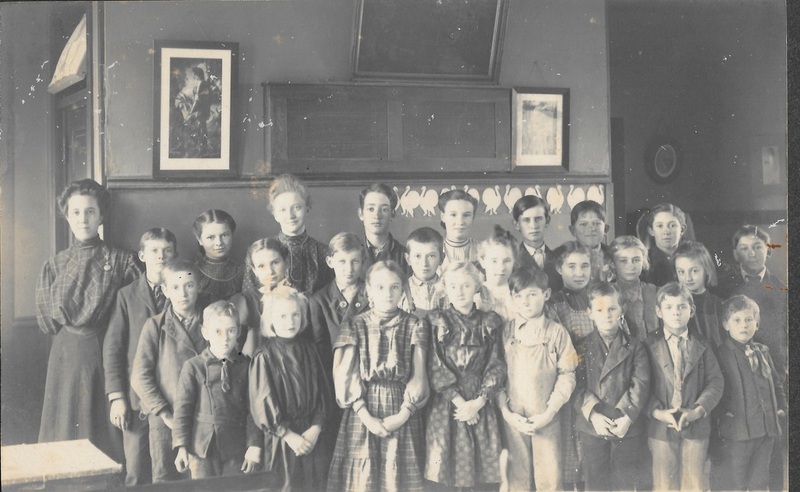 Photo 262 - Circa 1910, Classroom at District 33 (the school in town). Photo 262. There are handwritten notes about the students' names. Unfortumately, there were 3 notes and their order was not maintained so we don’t know which students go with which name. When posted on Facebook, Terry Purcell said that Emory Purcell, who is on the list, was actually Emory Miller, who her great grandpa adopted from the Orphan Train. Terry says the family story is that Emory Miller was so much trouble that they sent him back to New York. Which one is Emory Miller is unknown. Photo 196 - 1906, Central Exchange Telephone Operator Erma Mitchel with Chester Fisher, M. Purcell, and Lou Billings. Photo 402 - The Table Rock depot. Mylum Purcell and niece Ruth McCoy are in the crowd. Thank you to Terry Hunt Korell for sharing this family picture. Photo 671 - Photo labeled "Jack Purcell"
Photo 672 - Mr. and Mrs. J. H. Purcell. The identity of the boys is unknown. Photo 649 - Cutting wood - George Purcell is on the far right. The photo labels him on as on the left, but Purcell descendant Terry Hunt Korell is confident that George is the one on the right, and other photos of George confirm that. With him are are Abe Kimes, Cochran, and John Cochran. Purcell descendant Terry Hunt Korell has provided considerable comment on the identity of family members in the picture. “Just looked it up and they were married on Feb 16, 1860 so this would be Feb 16, 1910 right? Golden is fiftieth isn't it? That would make my Grandmother 16. The picture is pretty blurry but my guess from the shapes is that Della my Great Grandmother is sitting next to James Purcell the man with the beard in the middle of the front row and that my grandmother is the woman in the white shirtwaist in back of and to the left of Della. Of course Grandma Margie as they called Margaret is sitting next to James (Grandpa Jimmie). 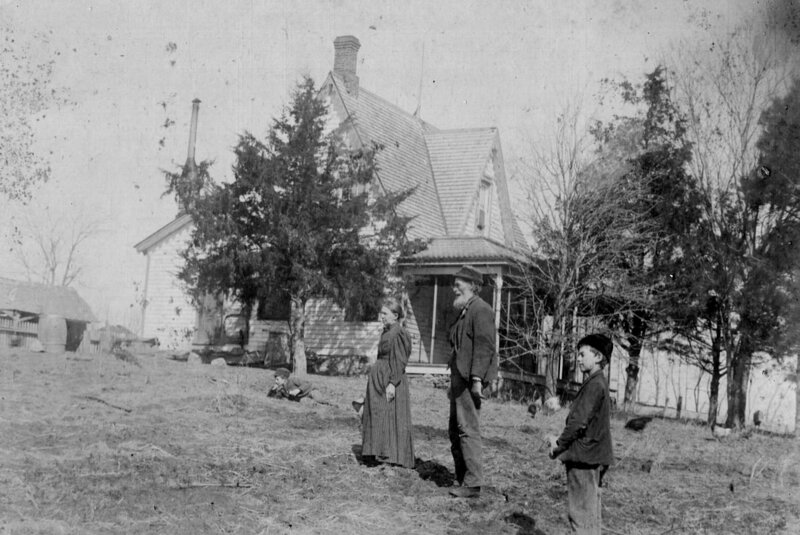 This would have been the old farm house out where my Uncle Fred Muscheites lived only further down the road nearer the railroad tracks. It burned in 1932. She added, “I think maybe the man to the right of Margaret is their son Jack Purcell with his wife Ida right behind him. He's the one who owned the Purcell Store. Here goes. These relationships are to James H Purcell whose anniversary picture this is. Beatrice T Purcell--Granddaughter. Daughter of Willard his son. Geneivieve Deloros Purcell--Granddaughter. Daughter of Mylum his son. Ida M Purcell--Daughter in Law. Married to Albert Jack his son. Maudie V Purcell--Granddaughter. Daughter of Albert Jack his son. Vivian T Purcell--Granddaughter. Daughter of Willard his son. I can't seem to find where Willam, Devilla, and Jane fit in. So many of these died really young. Vivian and Beatrice were sisters who died within days of each other. The family story goes that the family went to the Pawnee County Fair where they ate something that gave them food poisoning and they died a few days later. 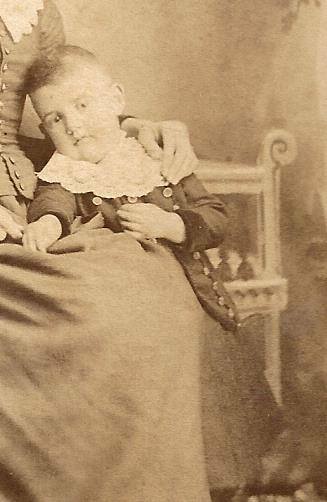 Mylum's daughter Genevieve was only 8 months old when she died. Maudie Purcell, A J (Jack's) daughter was only 21 according to my Grandmother when she died of appendicitis. They operated on her on the kitchen table. Edward Purcell was only 19 when he died. May 24, 1900 - 57th birthday of Mrs. J. H. Purcell. The directory of businesses and farmers includes the business of Albert J. Purcell, agricultural implements. Beatrice Brick & Tile Co, John Fulton mgr. Brock C H, well borer. Burgert Lewis, patent door springs. Carman C, harness and shoemaker. Castleton C B, well digger. Conklin Thomas W, hotel, confectionery. Craig & Wemple, mgrs Lincoln Vitrified Paving and Pressed Brick Co.
Diven D Q, poultry breeder. Fellers L & M Mrs. millinery. Fulton John, mgr, Beatrice Brick and Tile Co.
Griffing O W, contractor, builder. Jennings R P, J T Martin, mgr, grain elevator, coal. Lincoln Vitrified Paving and Pressed Brick Co, Craig & Wemple mgrs. Marble M H, real estate. Martin Gabriel R, meat market. Martin & white, grain dealers. Montgomery House, J. Montgomery prop. Montgomery J, prop Montgomery House. Norris Chauncey H, genl mdse. Purcell Albert J, agl implts. State Bank of Table Rock, John R Clark pres, David K Miller cashier. Stewart & Purcell, meat market. Table Rock Argus, F H Taylor, prop. Table Rock Clay Co, G R Martin pres and mgr, Wm White sec, Wm Sutton treas brick mfrs. Table Rock Creamery Association, G R Martin pres, Wm Sutton sec, and mgr, David K Martin treas. Taylor F H, prop Table Rock Argus. Tibbetts Oscar D, genl mdse. White Wm, agl implts, lumber. Wilson W H, drugs, phys. Photo 435 - The Purcell Store. Thank you to Terry Hunt Korell for sharing this family photo. On February 6, 1920, the Purcell Store -- along with many other of the businesses on the South side of the square -- was destroyed by fire. Actually as a result of the fire -- when the remaining wall of a building next to was knocked down after the fire, it fell on the frame Purcell store. Photo 125. 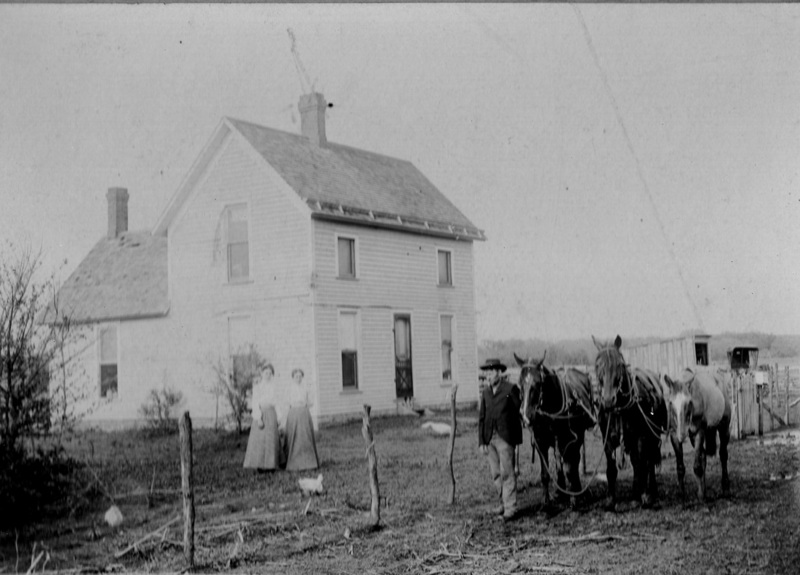 Purcell's store can be seen on the far left, still standing. But not for long. February 6, 1920, the morning of the fire -- a lot of letter setting by the editor to report the fire the same day.... This article is difficult to read, but transcribed in the link above. It identifies the buildings destroyed, and tells of the demise of the Purcell building. February 13, 1920, the clean up. "Uncle Jim Purcell" intends to rebuild. Purcell rebuilt. Eventually the store was sold. It was a grocery store run by Jeff and Crystal Knapp. It was the electronics repair store of Gary Vrtiska. Eventually it was torn down. 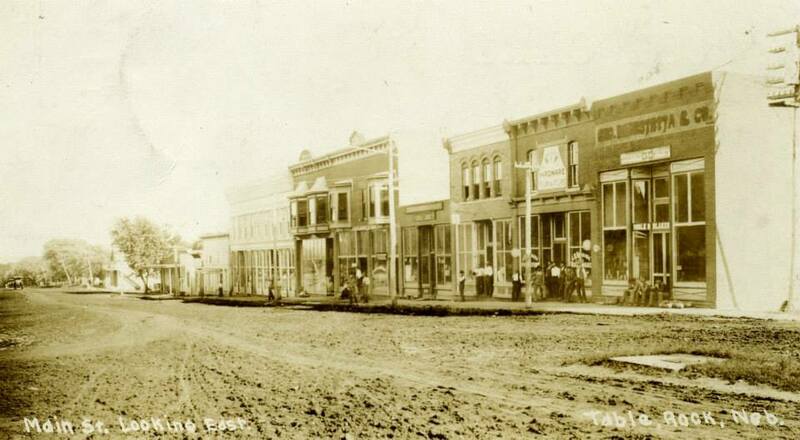 Here is a view of the town with the the building still standing in its later days. 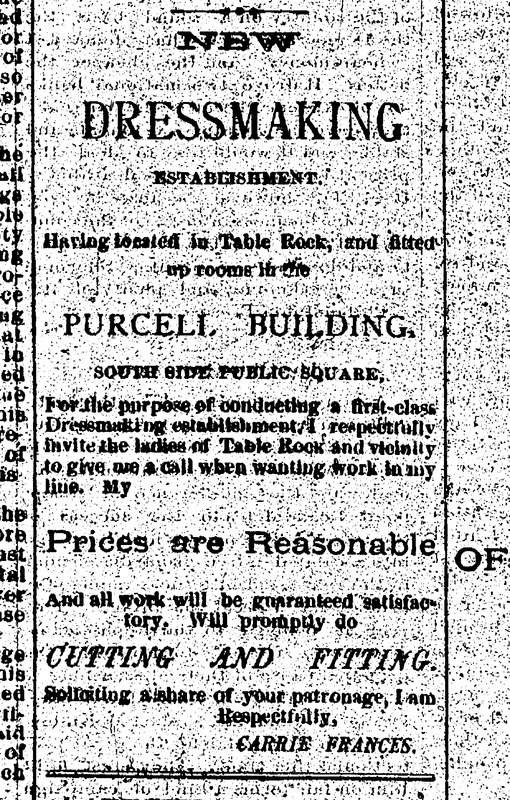 The Purcell store is in the middle of the block, standing alone. 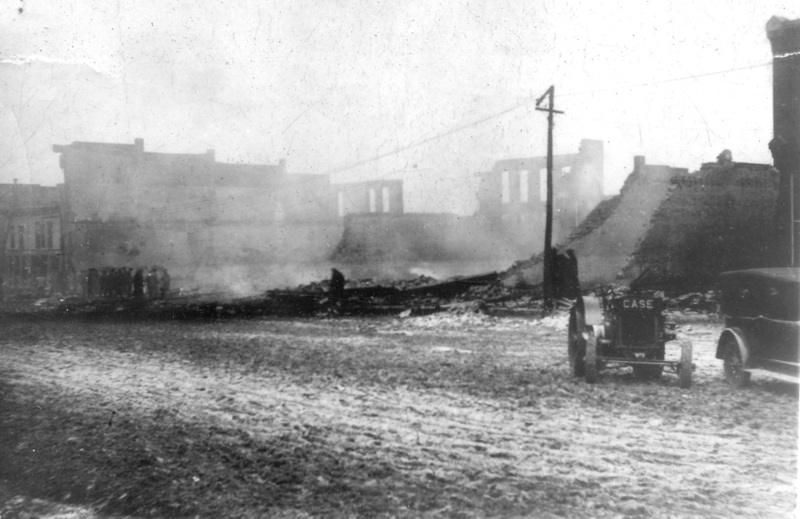 The block of buildings at the left survivied the fire, and the farthest two of the four buildings to the right. Purcell and the two buildings on the other side of the empty lot from it was rebuilt. The building attached to the left of the Purcell store was a blacksmith shop.